Background: The prevalence of Type 2 diabetes mellitus (T2DM) has been increasing globally in the recent decades. Physical activity (PA) helps preventing diabetes complications by keeping the blood sugar of T2DM patients within the normal range. The objective of this study was to explore underlying beliefs corresponding to PA in T2DM patients using health action process approach (HAPA). Methods: This cross-sectional study was conducted in Isfahan, 2015. A convenience sample of 203 participants with T2DM was collected. Participants completed HAPA inventory containing the following constructs: Risk perception, outcome expectation, task self-efficacy, intention, action and coping planning, coping self-efficacy, recovery self-efficacy, and PA questionnaire. Structural equation modeling was used for statistical analysis. Results: The common fit indices revealed that the HAPA had an acceptable fit to the observations (CMIN/df = 2.36 [P < 0.001], root mean square error of approximation = 0.089, comparative fit index = 0.891, normal fit index = 0.902). Intention was associated with task self-efficacy (β = 0.92, P < 0.001), whereas risk perception (β = 0.16, P = 0.073) and outcome expectation (β = 0.32, P < 0.081) did not predict intention to participate in PA behavior. PA was well predicted by planning (β =0.84, P < 0.01) while it was not significantly associated to coping self-efficacy (β = 0.66, P = 0.73) and recovery self-efficacy (β = 0.6, P = 0.69). Conclusions: HAPA could be used as a proper framework to identify the beliefs of the patients with T2DM and guide for effective theory-based interventions regarding PA. Type 2 diabetes mellitus (T2DM) is considered as a developing health problem which has been of concern worldwide. Due to some factors such as extension of populations, urbanization, growing prevalence of obesity, aging, and physical inactivity, the total number of T2DM patients is predicted to double in the next decade. According to estimates, up to 15% increase in the T2DM prevalence will occur in the developing countries, such as Iran, in the next 25 years. Previous studies have revealed a severe growing of both incidence and prevalence of T2DM in Isfahan, a city that located in the middle of Iran. Noticeable size of T2DM patients' population in Iran, and especially in Isfahan, necessitates proper interventions aiming at prevention and control of T2DM. There is no definite cure for T2DM in the medical literature but rather it is well accepted that preventing and controlling further complications are the only options to conquer this disease. Therefore, maintaining patient blood sugar within a natural range could be helpful. However, it is crucial for T2DM patients to choose a healthy lifestyle, exclusively having enough physical activity (PA), to reach this goal. However, PA in T2DM patients is rarely conformed in a proper way due to the underlying condition  such as confusing messages and recommendations received from different sources (health professionals and medias), for example, about benefits and disadvantages of PA. Currently, promoting healthy behaviors among T2DM patients is the main focus of diabetes clinics; however, the patient's beliefs are overlooked by released messages. Determining intrapersonal beliefs associated with PA along with designing educational programs based on these beliefs could lead to more effective behavioral interventions on the management of T2DM and consequently diminution of probable complications. One recommended approach in this line is to use a theory-based framework by which effective psychological factors are identified, tested, and applied so as to well educate the patients. In HAPA, health behavior change constitutes a sequence of motivational processes resulting in intention formation. This is followed by volitional processes that operate between intention formation and behavior enactment and help fill in the intention–behavior gap. There are distinct social cognitive predictors relevant and responsible for transition from each stage or mindset to the following one. For nonintenders, i.e., those at a nonintentional stage, predictors such as risk perception, outcome expectations, and task self-efficacy that lead to intention formation are the key targets for intervention. Risk perception refers to one's perception on being at risk of a specific health problem and may serve as a trigger to make person start thinking about amending his health behavior. Outcome expectations appertain to the expectations for positive rather than negative consequences that result from the behavioral change. Task self-efficacy describes confidence of a person in his ability to start the behavioral change. On the other hand, interventions on the volitional predictors of behavior that mediate between intention and behavior are the most beneficial for intenders, i.e., those at an intentional stage. These include action planning, coping planning, coping self-efficacy, and recovery self-efficacy to name a few. Action planning refers to the schedule on when, where, how, and with whom the person will do the intended behavior. Coping planning relates to the person's prediction from and his plans to circumvent the obstacles that might barricade the accomplishment of the intended changes. Coping self-efficacy and recovery self-efficacy are crucial for the initiation and maintenance of behavioral changes. The first refers to having an optimistic belief about the person's ability to maintain the behavioral changes, where the second refers to his confidence in his ability to restart the behavioral task after a plausible relapse. In brief, the model suggests that there are theory-driven constructs that determine relevant targets for an intervention for people at different stages of change. Previous studies highlighted planning and self-efficacy constructs as most prominent predictors of PA.,, However, it is necessary to test theoretical frameworks in target population to identify factors that can be handled to achieve optimal behavior change before implementing the intervention. This study aimed to test the predictive power of the HAPA in perceiving PA behavior among T2DM patients. To investigate the HAPA performance in T2DM patients, we carried out the present descriptive analytic study on participants recruited from referral Feyz and Al Zahra Hospitals, in Isfahan, Iran, using a convenience sampling method. All participants were adults with T2DM who had recourse for care in between July 10, 2015 and December 20, 2015. Inclusion criteria were as follows: (a) Diagnose with T2DM, (b) no history of T2DM complications, (c) being able to communicate, and (d) being able to provide informed consent. Patients with T2DM complications and those with a history of cognitive impairment were excluded from the study. The study was approved by the Ethics Committee of the Isfahan University of Medical Sciences. Based on experts recommendations, collecting the sample size of 5–10 for each parameter in model was appropriate to run a structural equations modeling. Since there were 35 parameters in our model, the number of participants seemed to be adequate to meet minimum sample size per each parameter. The medical records of patients were reviewed and qualified individuals based on the inclusion criteria were invited to participate. Before filling the questionnaire, the primary researcher briefly explained the purpose of the study to the participants. For those participants who were unable to fill the questionnaire, data were collected by trained interviewers through a face-to-face interview. After the interviews were completed, participants' medical records were abstracted to be used as clinical and laboratory data. There were seven scales in HAPA inventory; each item was rated on a seven-point scale with anchors varying based on the content of the scales. All scales aimed performing PA as the outcome. All HAPA inventory scales were scored from 1 to 7 and averaged for a possible range in all of the scales, with higher scores indicating better status of responder in that scale toward doing PA. For all scales, Cronbach's alpha was calculated. The validity and reliability of this questionnaire have been previously tested by Rohani et al. A single scale with three-item of Schwarzer guidelines was used to measure action self-efficacy. Each participant rated his confidence in his physical ability to do at least moderate-intensity PA with no stop in one session of length 10, 20, and 30 min if they were motivated enough to do so. Behavioral intention was evaluated with three items proposed by Ajzen  with questions such as “I intend to do at least 150 min/week moderate-intensity PA in the next 2 months” with responses from 1 = extremely unlikely to 7 = extremely likely. Action planning was assessed using four items recommended by Schwarzer et al. to discover whether they had made detailed plans regarding their PA in terms of (a) how, (b) when, (c) where, and (d) with whom they will start PA. Coping planning was measured using same scale anchors as action planning with three items. Participants were requested to rate their detailed plans about what they do if something interferes with PA. For this, we used items recommended by Schwarzer's  for assessing coping plans. This item measured participants' confidence in their ability to do PA even if they had to overcome a certain barrier. Previous studies within T2DM patients have suggested nine barriers, including  tiredness, the time limitation, the lack of facilities, and bad weather conditions, to name a few. This item measured participants opinions on getting back on track after being derailed in other word his/her capability to regain control after a failure or setback. Participants were asked their confidence in ability to return to PA after quit this behavior. Following this header, responses were extracted to four more specific questions such as: “I am sure I can continue PA if I postpone my plans several times. We used the short-form version of the international PA questionnaire (IPAQ) to measure participants' PA behavior over the past 7 days. The validity of IPAQ as a measure of PA behavior in Iranian population has been previously established. Due to low effect of time spent walking on improvement of T2DM blood sugar, we modified the IPAQ and discarded the items related to time spent walking. All the participants were assured that their information will be kept under the custody of the main researcher and could not be available to any unauthorized person except supervisors. Bivariate correlation and structural equation modeling (SEM) in using maximum likelihood estimation method were used to test the hypothesis. The overall model fit was evaluated using relative Chi-square (CMIN/df), comparative fit index (CFI), normal fit index (NFI), and root mean square error of approximation (RMSEA). The following values are recommended as indicating a good fit of the model to the data: CMIN/df between 1 and 2, CFI and NFI ranging from 0.90 to 1, and RMSEA below 0.08. Kolmogorov–Smirnov test performed for normality test and identification of outliers before further analysis. First, 248 patients were included in the study based on the inclusion criteria. Then, 45 patients were excluded by exclusion criteria. The participants (n = 203) were mostly male (56%) and married (80%). The mean age was 48.51 ± 18.9 years and most educational status was high school diploma (31.5%). Results showed that participants had low PA amount on average. Further details are shown in [Table 1]. Cronbach's alpha was acceptable for all scales [Table 2]. All scales were normal (P > 0.05). Initial findings indicated poor PA status among patients [Table 2]. Moderate correlations were present between variables [Table 2]. Furthermore, the finding of structural model and fit indices was as follow: CMIN/df = 2.36 (P< 0.001), RMSEA = 0.089, CFI = 0.891, NFI = 0.902, indicating a satisfactory fit. As a result, the HAPA model is reasonably predicting PA. The estimates of the coefficients of the latent variables and corresponding P values are displayed in [Figure 1]. Intention was associated only with task self-efficacy (β = 0.92, P < 0.001). That is, PA is increased by higher task self-efficacy. Risk perception (β = 0.16, P = 0.073) and outcome expectation (β = 0.32, P = 0.081) did not predict intention to participate in PA. 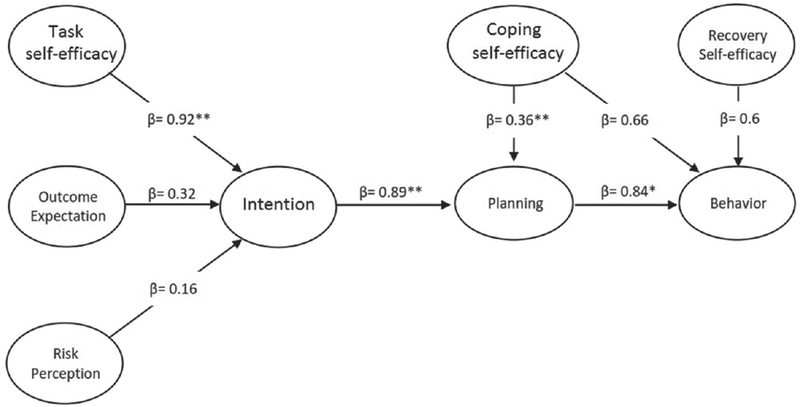 Intention (β = 0.89, P < 0.001) and coping self-efficacy (β = 0.36, P < 0.001) were positively associated with action and coping planning. That is, the greater intention and coping self-efficacy, the better planning. Finally, PA was significantly predicted by planning, so that higher scores on action and coping planning (β = 0.84, P < 0.01) were associated with higher scores on PA. No statistical association was found between coping self-efficacy (β =0.66, P = 0.73) and recovery self-efficacy (β = 0.6, P = 0.69) and behavior. This study was conducted to evaluate the HAPA approach in explaining PA behavior among patients with T2DM in Isfahan. According to the results of the SEM, the HAPA could be utilized to explain PA intention and behavior of T2DM patients. Our findings indicated that most of the participants had low PA levels which are consistent with the other studies on Iranian T2DM patients. Therefore, in spite of all the efforts, low PA still is a major problem in Iranian community suffering from T2DM, and thus, there is a need for using new strategies such as more evidence-based educational/environmental interventions to overcome this problem. Based on HAPA, among three predictors of intention, task self-efficacy was the only significant one, which is compatible with recent studies in the field of health behavior such as Zhou et al. in Chinese population  and Radtke et al. in England and Switzerland. Furthermore, Namadian et al. revealed borderline significant relationship between self-efficacy and walking has been documented. Also, these findings are in line with the local interventional studies which has been carried out in Iranian population. Consecutive harvests by all of these various studies can inform us about the strong role of this construct in HAPA. Patients with T2DM have iteratively relapsed while performing healthful behaviors due to the chronic nature of this disease and as a result, they are low confident in starting over for new healthful behaviors. Therefore, as was found in this study, healthy behaviors such as PA can be enhanced by gaining self confidence in these patients. This study revealed that more outcome expectation of doing PA is not associated with more intention to do PA. Our results is in accord with previous findings in T2DM patients., However, a significant relationship has been previously reported between this construct and intention in nondiabetics populations.,, A probable explanation might be that the target population of our study was diabetic patients who have low life expectation and low quality of life.,, Accordingly, they do not imagine a good perspective for their lives, so that positive expectation of a better life might not make them behavioral intended. Similar to other studies,,, no significant relationship was found between risk perception and the intention to eat a PA. It might be due to the fact that the fear appeal approach has focused on using risk communication to let people realize how much they are at risk for illness or injury. The effectiveness of such interventions as stand-alone strategies is doubtful at the least. As an alternative, it has been suggested that rather than using fear in health interventions, other factors, such as action and coping planning, can be used instead by health educators so as to promote health behaviors among T2DM patients. This is because these factors can improve patients' self-confidence and self-control, so they can change their risky behaviors such as physical inactivity. In the present study, behavior could not be predicted by coping and recovery self-efficacy which is inconsistent with HAPA principles and is opposite to the previous studies on healthful behaviors ,, and PA , in special. However, this could be due the target population of the current study (T2DM patients) compared to other studies. Considering the rapid changes in blood sugar within these patients and its possible behavioral impacts, it is probably difficult for them to continue or return to behavior. One recommended approach in educational programs is to use other factors such as behavior planning in health interventions on these patients, that is, to be preplanned to reduce instant decision-making that leads to a continued healthful behavior among these patients. The results suggest that a connection between coping self-efficacy is indirectly linked with PA through planning construct. It can be for this reasons that the planning of behavior can reduce barriers of PA and facilitate the maintenance of behavior. Therefore, using coping self-efficacy along with behavior planning is recommended in educational PA interventions on T2DM patients. The systematic review performed by Armitage and Conner  aimed at evaluating the effect of theory of planned behavior on healthful behaviors, low amount of change from intention to behavior was identified as the main problem to this theory, in which only 15% of behavioral changes on average was explained by intention. According to this, by adding factors mediating intention to behavior in the HAPA, the existing gap in between intention and behavior is covered which is approved by the findings of the present study. Generally, it is remained to be mentioned that the HAPA, due to its characteristic by which considers the barriers of behavior through coping planning and also coping self-efficacy construct, can be an appropriate model for understanding the healthful behavioral beliefs of the patients with T2DM, leading to more effective educational interventions. That is because there are more obstacles for these patients rather than other people  that should be necessarily considered while conducting health interventions. There are some limitations to this study. The first is the cross-sectional type of the design, in which is based on simple association and the causal relationships are missed. Future studies might be required to check for the findings of this study through an experimental design to clarify causal directions. The second was slight insufficiency in terms of sample size. However, by considering the low prevalence of the T2DM, which is below 10%, this limitation may conservatively be waived. Lack of objective PA measure such as pedometers and accelerometers was third limitation and could be considered in future works. According to the results of this study, HAPA could be used as a proper pattern to identify the beliefs of T2DM patients and guide for effective PA interventions. Due to lack of integrated planned educational programs to prevent T2DM and its complications in Iran and from our experience in this research, we recommend conducting broader theory-based investigations to identify beliefs involving PA within these patients in different Iranian cultures. This would help obtaining better prospective and more effective interventions. We are grateful to all participants for taking part in this study. This research was part of a PhD thesis at Isfahan University of Medical Sciences, funded under project number 394097. Guariguata L, Whiting DR, Hambleton I, Beagley J, Linnenkamp U, Shaw JE. Global estimates of diabetes prevalence for 2013 and projections for 2035. Diabetes Res Clin Pract 2014;103:137-49. Aune D, Norat T, Leitzmann M, Tonstad S, Vatten LJ. Physical activity and the risk of type 2 diabetes: A systematic review and dose-response meta-analysis. Eur J Epidemiol 2015;30:529-42. Basit A, Riaz M, Fawwad A. Improving diabetes care in developing countries: The example of Pakistan. Diabetes Res Clin Pract 2015;107:224-32. Talaei M, Sadeghi M, Marshall T, Thomas GN, Iranipour R, Nazarat N, et al. Anthropometric indices predicting incident type 2 diabetes in an Iranian population: The Isfahan Cohort Study. Diabetes Metab 2013;39:424-31. American Diabetes Association. Standards of medical care in diabetes-2015 abridged for primary care providers. Clin Diabetes 2015;33:97-111. Gauthier-Chelle K, Mennen L, Arnault N, Rigalleau V, Hercberg S, Gin H. Comparison of the diet of self-declared diabetics with non-diabetic patients in the SU.VI.MAX study: Did the diabetics modify their nutritional behavior? Diabetes Metab 2004;30:535-42. Morgan O. Approaches to increase physical activity: Reviewing the evidence for exercise-referral schemes. Public Health 2005;119:361-70. Blue CL. Does the theory of planned behavior identify diabetes-related cognitions for intention to be physically active and eat a healthy diet? Public Health Nurs 2007;24:141-50. Rohani H, Eslami AA, Ghaderi A, Bidkhori M, Raei M. Development and psychometric evaluation of a health action process approach inventory for healthful diet among type 2 diabetes patients. Int J Prev Med 2016;7:69. Schwarzer R, Richert J, Kreausukon P, Remme L, Wiedemann AU, Reuter T. Translating intentions into nutrition behaviors via planning requires self-efficacy: Evidence from Thailand and Germany. Int J Psychol 2010;45:260-8. Scholz U, Keller R, Perren S. Predicting behavioral intentions and physical exercise: A test of the health action process approach at the intrapersonal level. Health Psychol 2009;28:702-8. Schwarzer R. Modeling health behavior change: How to predict and modify the adoption and maintenance of health behaviors. Appl Psychol 2008;57:1-29. Lippke S, Plotnikoff RC. Testing two principles of the health action process approach in individuals with type 2 diabetes. Health Psychol 2014;33:77-84. Namadian M, Presseau J, Watson MC, Bond CM, Sniehotta FF. Motivational, volitional and multiple goal predictors of walking in people with type 2 diabetes. Psychol Sport Exerc 2016;26:83-93. Schwarzer R. Self-regulatory processes in the adoption and maintenance of health behaviors. J Health Psychol 1999;4:115-27. Schwarzer R. Social-cognitive factors in changing health-related behaviors. Curr Dir Psychol Sci 2001;10:47-51. Schwarzer R, Luszczynska A, Ziegelmann JP, Scholz U, Lippke S. Social-cognitive predictors of physical exercise adherence: Three longitudinal studies in rehabilitation. Health Psychol 2008;27:S54-63. Calder BJ, Phillips LW, Tybout AM. Designing research for application. J Consum Res 1981;8:197-207. Brown TA. Confirmatory Factor Analysis for Applied Research. New York: Guilford Publications; 2015. Rohani H, Eslami AA, Ghaderi A, Jafari-Koshki T, Sadeghi E, Bidkhori M, et al. Validation and psychometric evaluation of physical activity belief scale among patients with type 2 diabetes mellitus: An application of health action process approach. Health Promot Perspect 2016;6:71-9. Perloff LS, Fetzer BK. Self-other judgments and perceived vulnerability to victimization. J Pers Soc Psychol 1986;50:502. Suri B, Tariq O. General perception of diabetes, social support and outcome expectancies related to adherence among people with type 2 diabetes. Eur Health Psychol 2014;16:348. Chlebowy DO, Garvin BJ. Social support, self-efficacy, and outcome expectations: Impact on self-care behaviors and glycemic control in Caucasian and African American adults with type 2 diabetes. Diabetes Educ 2006;32:777-86. Schwarzer R, Sniehotta FF, Lippke S, Luszczynska A, Scholz U, Schüz B, et al. On the assessment and analysis of variables in the health action process approach: Conducting an investigation. Berlin: Free University of Berlin; 2003. Korkiakangas EE, Alahuhta MA, Laitinen JH. Barriers to regular exercise among adults at high risk or diagnosed with type 2 diabetes: A systematic review. Health Promot Int 2009;24:416-27. Booth ML, Ainsworth BE, Pratt M, Ekelund U, Yngve A, Sallis JF, et al. International physical activity questionnaire: 12-country reliability and validity. Med Sci Sports Exerc 2003;195:1381-1395. Moghaddam MH, Aghdam FB, Jafarabadi MA, Allahverdipour H, Nikookheslat SD, Safarpour S. The Iranian Version of International Physical Activity Questionnaire (IPAQ) in Iran: Content and construct validity, factor structure, internal consistency and stability. World Appl Sci 2012;18:1073-80. Byrne BM. Structural Equation Modeling with AMOS: Basic Concepts, Applications, and Programming. Abingdon: Routledge; 2013. Kim SH, Whitt W. The power of alternative Kolmogorov-Smirnov tests based on transformations of the data. ACM Trans Model Comput Simul 2015;25:24. Halali F, Mahdavi R, Asghari Jafarabadi M, Mobasseri M, Namazi N. A cross-sectional study of barriers to physical activity among overweight and obese patients with type 2 diabetes in Iran. Health Soc Care Community 2016;24:e92-e100. Zhou G, Gan Y, Knoll N, Schwarzer R. Proactive coping moderates the dietary intention-planning-behavior path. Appetite 2013;70:127-33. Radtke T, Kaklamanou D, Scholz U, Hornung R, Armitage CJ. Are diet-specific compensatory health beliefs predictive of dieting intentions and behaviour? Appetite 2014;76:36-43. Gholami M, Lange D, Luszczynska A, Knoll N, Schwarzer R. A dietary planning intervention increases fruit consumption in Iranian women. Appetite 2013;63:1-6. MacPhail M, Mullan B, Sharpe L, MacCann C, Todd J. Using the health action process approach to predict and improve health outcomes in individuals with type 2 diabetes mellitus. Diabetes Metab Syndr Obes 2014;7:469-79. Perrier MJ, Sweet SN, Strachan SM, Latimer-Cheung AE. I act, therefore I am: Athletic identity and the health action process approach predict sport participation among individuals with acquired physical disabilities. Psychol Sport Exerc 2012;13:713-20. Schwarzer R, Schuz B, Ziegelmann JP, Lippke S, Luszczynska A, Scholz U. Adoption and maintenance of four health behaviors: Theory-guided longitudinal studies on dental flossing, seat belt use, dietary behavior, and physical activity. Ann Behav Med 2007;33:156-66. Laxy M, Hunger M, Stark R, Meisinger C, Kirchberger I, Heier M, et al. The burden of diabetes mellitus in patients with coronary heart disease: A methodological approach to assess quality-adjusted life-years based on individual-level longitudinal survey data. Value Health 2015;18:969-76. Livingstone SJ, Levin D, Looker HC, Lindsay RS, Wild SH, Joss N, et al. Estimated life expectancy in a Scottish cohort with type 1 diabetes, 2008-2010. JAMA 2015;313:37-44. Ambriz Murillo Y, Menor Almagro R, Campos-González ID, Cardiel MH. Health related quality of life in rheumatoid arthritis, osteoarthritis, diabetes mellitus, end stage renal disease and geriatric subjects. Experience from a General Hospital in Mexico. Reumatol Clin 2015;11:68-72. Chow S, Mullan B. Predicting food hygiene. An investigation of social factors and past behaviour in an extended model of the Health Action Process Approach. Appetite 2010;54:126-33. Arbour-Nicitopoulos KP, Duncan M, Remington G, Cairney J, Faulkner GE. Development and reliability testing of a health action process approach inventory for physical activity participation among individuals with schizophrenia. Front Psychiatry 2014;5:68. Armitage CJ, Conner M. Social cognition models and health behaviour: A structured review. Psychol Health 2000;15:173-89. Lawton J, Ahmad N, Hanna L, Douglas M, Hallowell N. 'I can't do any serious exercise': Barriers to physical activity amongst people of Pakistani and Indian origin with type 2 diabetes. Health Educ Res 2006;21:43-54. Esteghamati A, Etemad K, Koohpayehzadeh J, Abbasi M, Meysamie A, Noshad S, et al. 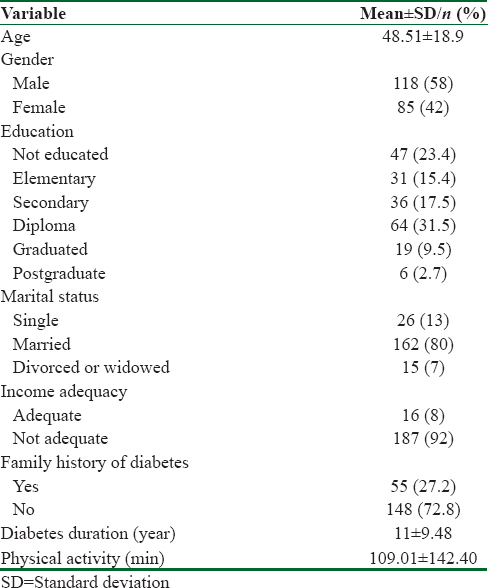 Trends in the prevalence of diabetes and impaired fasting glucose in association with obesity in Iran: 2005-2011. Diabetes Res Clin Pract 2014;103:319-27.